Costs Temper Demand For Organic Foods : Shots - Health News A solid majority of American say they prefer to eat organic over non-organic food. But the fondness for organic food isn't universal. Older people don't care for it nearly as much as the rest of the population. And the cost of organic food is an issue. 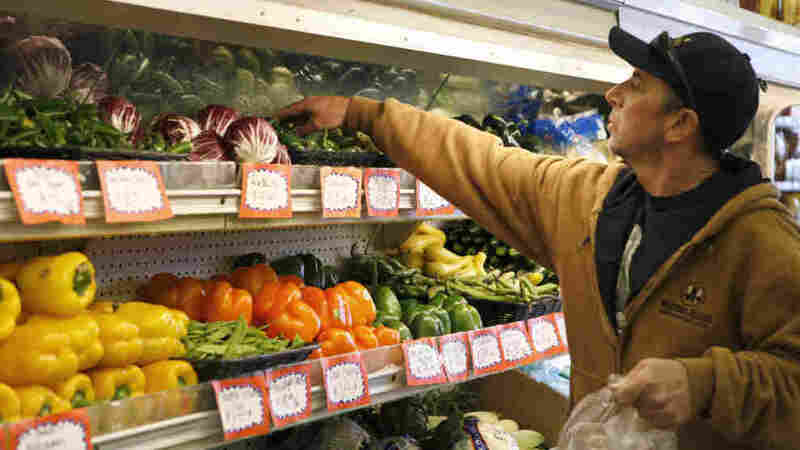 Kevin Gomes shops for produce at Pacifica Farmers Market in Pacifica, Calif., in March. We've been curious about how Americans view their food options. Concerns about toxins in some produce have led some people we know to go organic. But recent outbreaks of foodborne illness tied to organically grown sprouts in Europe underscore that an organic label isn't exactly a free pass to health. After price, the second-most common reason people prefer non-organics is that they're more readily available, a sentiment expressed by 21 percent of respondents. When it comes to buying produce, 43 percent of people would like to get their fruits and veggies at a farmers market. Supermarkets come in second at 32 percent. And home gardens are third at 20 percent. Finally, we wondered about eating out. Do organic labels on menu items affect how Americans order? Not so much, it turns out. About a third of people — 34 percent — said they do prefer organic choices at restaurants, but that leaves about two-thirds of people uninterested or unmoved by organic options. The telephone poll was conducted during the first half of May, and the margin for error is plus or minus 1.8 percentage points. To see the questions and more details about the responses, click here.